Forced Air Systems, Inc. is an HVAC company based in Stoughton, Massachusetts. We provide service, maintenance, and installation for Commercial as well as Residential accounts. 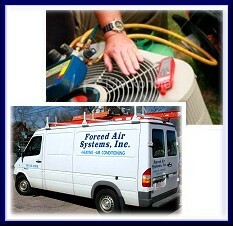 Forced Air Systems, Inc. provides 24 hour emergency service 365 days a year. Priority is given to regular contract customers. Forced Air Systems, Inc. will customize a maintenance program that precisely fits the needs of the equipment and building personnel. Forced Air Systems, Inc. can provide new installation, retrofit, and upgrading of your	HVAC equipment. With a call to Forced Air Systems, Inc., you will be greeted by a courteous, respectful, trained technician; we take pride in keeping the customer informed and fixing any problem promptly with little down time. Forced Air Systems, Inc. is a member of the Better Business Bureau and the Stoughton Chamber of Commerce as well as supportive of many local civic organizations.